Welcome to Daily Word Solutions website. We are posting here Wordscapes in Bloom Daily Puzzle Answers. We solved all 3500 levels of Wordscapes in Bloom in December 2018 and we are posting now here daily puzzle answers. Wordscapes in Bloom is a game developed from PeopleFun, one of the best Word Game developer studios of 2018-2019. Is one of their best games totaling more than 1 million of installs only on android devices (January 2019). 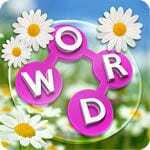 Wordscapes in Bloom April 18 Answers & Solutions for the hint: YUTJAN.